Thrissur, April 8: Board exams are the first step for a student to face the real academic world and test their merit. 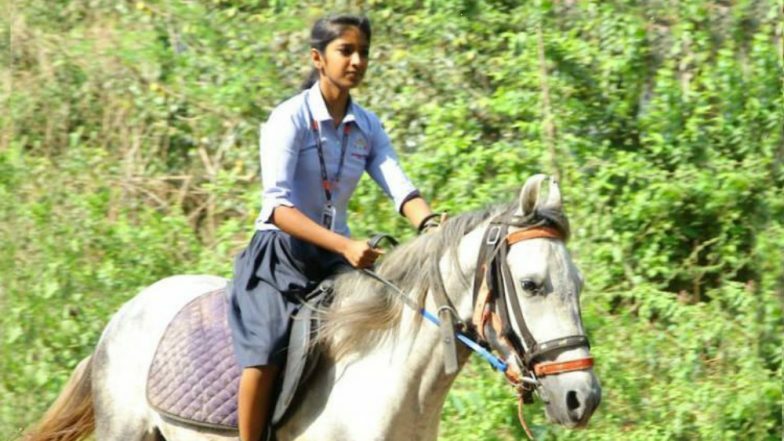 Students are mostly seen worried about their future career, but this class tenth girl from Mala town in Thrissur of Kerala - CA Krishna - has eased her exam tensions by riding a horse to her last SSLC examination. The video of the girl riding the horse has gone viral and the talking point in the state. According to the report, published in The News Minute, Krishna is a student of Holy Grace Academy and she chose to ride the horse to school on the last day of her board exams to appear for social studies paper. She said, as the daily quotes, "I was nurturing the hope of riding the horse to attend the Board examination for quite some time. On the last day of exams, it was the social studies paper, and I chose to ride the horse to school on that day." Viral Pic of Mizoram Boy Who Took Injured Chicken To Hospital Turned Into a Beautiful Portrait by a Kerala Artist!. She added: "Many had said that it will be a risky affair to ride the horse on a Board exam day, considering the traffic and other issues. But I thought it was all right. I've been training in horse riding from the time I was studying in the seventh standard. I have gone to school riding the horse on some other occasions in the past. Last year also, I rode the horse to attend my ninth standard exam." Being the only child of Ajay Kalindi and Indu, Krishna is the proud owner of two horses - both gifted by her father. While her father works as a priest at the nearby Vishnu temple, her mother is a homemaker. Now with the video going viral, her father states that he will not be buying his daughter any more horses. After the video was uploaded on social media and it started making the rounds, Mahindra Group chairman Anand Mahindra congratulated her on Twitter and wrote, "Brilliant! Girls’ education is galloping ahead...A clip that deserves to go viral globally. This, too, is #IncredibleIndia"
Though several claimed that Krishna rode the horse to gain fame, her father rubbished the charges.